The Australian/New Guinean Magpie Goose (Anseranas semipalmata) is the sole extant member of the Anseranatidae. Putative stem group representatives of this taxon were reported from fossil sites in North America and Europe. The first species hypothesized to be such belong to the taxon Anatalavis, which was originally erected for A. rex from the late Cretaceous/early Paleocene Hornerstown Formation of New Jersey (Olson and Parris 1987). The holotype and only known specimen of this species is a distal humerus. However, a second species, A. oxfordi Olson, 1999 from the London Clay of Walton-on-the-Naze, is represented by a three-dimension-ally preserved partial skeleton, which includes elements of the wing and pectoral girdle, as well as the skull and portions of the sternum and pelvis (Fig. 6.6; Olson 1999b). Although it is rather unlikely that the goose-sized A. oxfordi belongs to the same "genus" as a North American species which lived some ten million years earlier, the fossil material does not allow an unambiguous separation. Mlikovsky's (2002) erection of a new taxon, Nettapterornis, for A. oxfordi is not well founded (Mourer-Chauvire 2004; Mayr 2005a). The presence of a large pneumatic foramen on the sternal end of the coracoid and the very wide sternal extremity of the furcula (Olson 1999b) are derived similarities of Anatalavis and Anseranas (Fig. 6.6), but the two taxa otherwise have a quite different skeletal morphology. 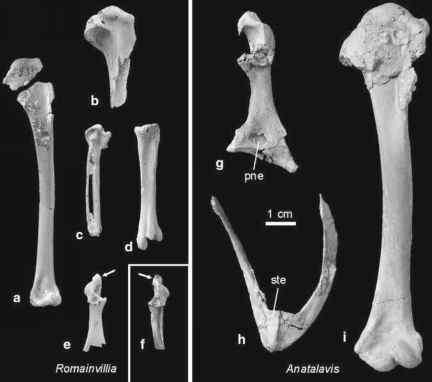 The humerus of A. oxfordi is proportionally shorter and more robust than that of crown group Anseriformes, and Olson (1999b) hypothesized that the taxon was capable of powerful and rapid flight. which led Olson (1999b) to assume that the skull of Anatalavis departed from that of extant waterfowl in aspects of its functional morphology. A. rex is further distinguished from all crown group Anseriformes in the short and blunt postorbital process (skull) and the short and broad praeacetabular portion of the pelvis (Olson 1999b). Olson's (1999b) classification of Anatalavis was challenged by Dyke (2001b), who did not, however, include in his analysis all potential synapomorphies of Anseranas and Anatalavis listed by Olson (1999b). Revision and reanalysis of the data support a sister group relationship between Anatalavis and Anseranas (Mayr 2008f), although this hypothesis certainly needs to be bolstered with additional evidence. A pneumatic opening on the coracoid, for example, also occurs in the Anhimidae and some galliform birds, and is thus either plesiomorphic for Anseriformes or evolved several times independently within Galloanseres (in which case it would be a weak character). The sternal extremity of the furcula is further a thin sheet in Anatalavis but thickened and pneumatized in Anseranas. If Anatalavis is the sister taxon of Anseranas, it indicates that a duck-like beak was already present in the stem species of the clade (Anseranatidae + Anatidae). Another putative anseranatid, Anserpica kiliani was described from the late Oligocene of France by Mourer-Chauvire et al. (2004). This species is only known from a coracoid which is very similar to that of Geranopsis hastingsiae Lydekker, 1891 from the late Eocene and early Oligocene of England, a presumed representative of the Gruoidea, with which it was not compared (see Sect. 9.3.4; Mayr 2005a). 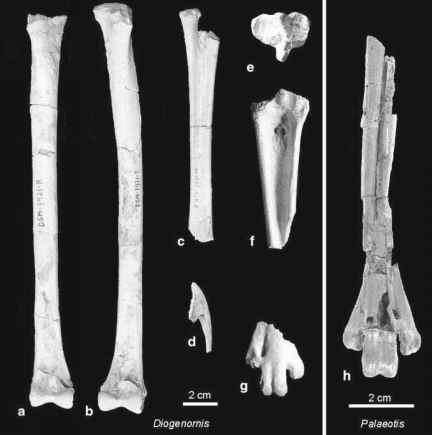 The earliest Australian stem group representative of the Anseranatidae was reported by Worthy and Scanlon (2009) from the late Oligocene/early Miocene of the Riversleigh Formation. This new species was assigned to the taxon Anseranas and is represented by a coracoid and referred scapulae. It mainly differs from the extant A. semipalmata by its smaller size and the presence of pneumatic openings in the acrocoracoid process.